Records found in the cavity of a window frame. 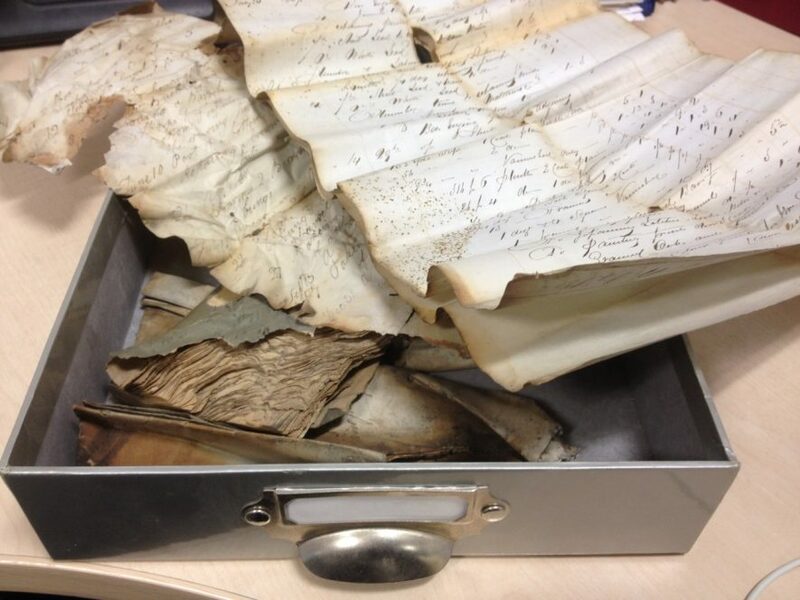 There’s something rather enigmatic about historical records uncovered in unusual places; recesses in fireplaces, outside barns open to the elements and marauding chickens, or secreted away in boxes in attics and greenhouses. This is despite the fact that for the most part, these records were put there for very practical reasons, as opposed to furtive ones. And yes, I do know for some archivists this will be pretty run of the mill stuff, but this was the first time I’d taken into custody records discovered in the cavity of a window frame. An early form of insulation? Presumably these accounting records had been to hand when 19th century workmen fitted or repaired a window, and thus being deemed surplus to requirements, were stuffed into a gap in the wall. Was this an early form of insulation? Work during the most recent replacement window yielded up these hidden papers, in a building which clearly has quite a history. Is it wrong to admit to a sense of utter satisfaction at removing an age of dust (and other unthinkable detritus), to expose a cleaner, though often well nibbled, sheet of paper? And to be thrilled at seeing traces of ink form into writing as light meets paper for the first time in 150 years? Yes, these are old and, to some, rather boring bills and receipts, but back in the Victorian era they knew how to create a receipt with a fair amount of artistry and, dare I say it, beauty. It is not likely that all of these records will survive to be handled again, such is the poor condition, but it is hoped the information they give, not only as part of the history of the house, but the history of local tradesmen and merchants, will survive for many hundreds of years to come. If you’ve found records in less than obvious places – or in the obvious places, get in touch as we’d love to know more!